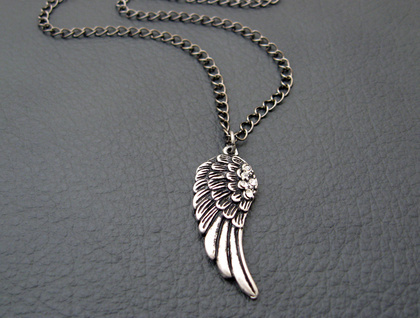 A beautifully detailed, antiqued-silver coloured angel wing pendant on gunmetal-black chain. The wing has highly detailed feathering, and at its shoulder are five tiny, clear rhinestones. The pendant slides freely on the chain, which fastens with a high quality, gunmetal black lobster-claw clasp. The clasp clips into a small ring on the end of the chain, but it can actually be clipped into any of the links on the chain, making this necklace easily adjustable. The wing pendants can face either way: that is, the tip of the wing may point to the left of the wearer, as in the photographs, or to the right. 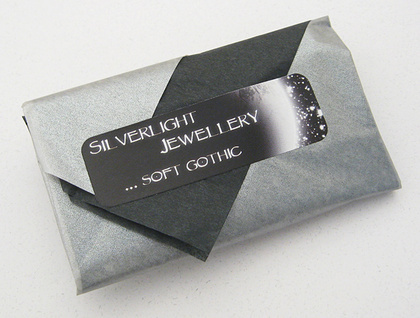 If you have a preference, please let me know in the 'note to seller' field when you check out of Felt; otherwise, I will send you whichever I have available. 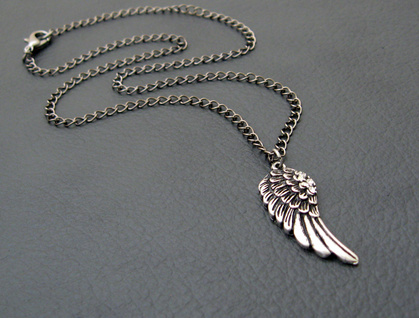 The 'Night-angel' necklace measures 42cm, including the clasp. 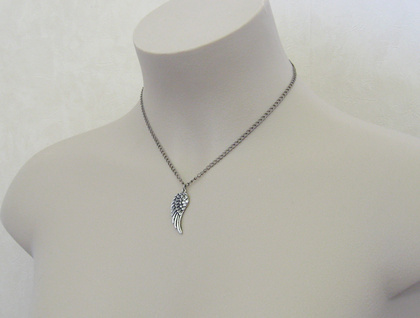 The wing pendant is 34mm long, including the baile (hanging loop), and 13mm across at its widest point.